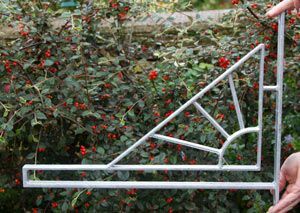 These fabulous ball end wrought iron brackets are hand made for from a local award winning blacksmith. For sign widths 300mm - 630mm. These are made for us by a local award winning blacksmith. They are forged on a traditional coal forge. The metal is shaped by hammering, bending and twisting to the required shape. The length of your sign will dictates what size bracket you require. We have listed under the size option the length of signs which will fit each bracket. This wrought iron bracket has a more contemporary look and feel to it. It can be left galvanised or painted black, white, Farrow and Ball Lichen (light green) or Farrow and Ball Purbeck Stone (light grey). It has been designed to be used with stainless steel fittings. The stainless steel eye bolts are included in the cost. The brackets can be attached to a building on onto a post. Sign fittings included. You can pay with a Card, by Phone, by Cheque, Online Banking or by or by Amazon. Click here to see other brackets. These top quality traditional wooden framed signs are extremely strong and durable, while adding class to any property. The inner panel is made of tricoya board, a wood based material which has a 50 year guarantee.